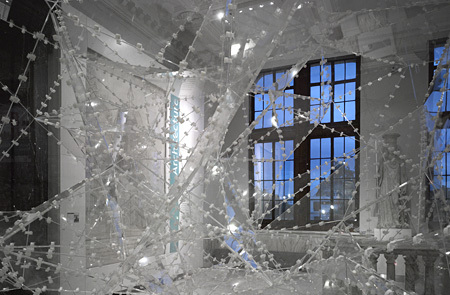 Having been invited to design and construct a small retreat structure at the '1:1 Architects Build Small Spaces' exhibition in the V&A Museum in London, Sou Fujimoto naturally chose to continue his mastery of blending nature and architecture; breaking down boundaries through the uses of voids and transparency, giving the spaces he creates a surreal duality. Nature has been Fujimoto's paramount concern and preoccupation - 'House N', a project completed in 2008, is a prime example of this mastery. With its towering white rectilinear walls covering the whole perimeter of the site, the house primarily appears to be a solid box, until voids and windows slowly emerge pierced from within by branches of the trees grown in the house. Like most of Fujimoto's architecture, his small structure in the V&A Museum has the same poetic dualities of both being outside and inside, natural and artificial, and raw and precise. From the floor of the heavy and solid marble landing, the lightweight plexiglas 'tree' grows upwards and outwards, branching elegantly to choreograph the surfaces of abstracted nature. The transparent surfaces are neither outside nor inside of the described surreal structure - it is simply both simultaneously. Primarily experienced from the outside, the 'tree' can also be experienced from the inside looking out into the museum space through a small opening. 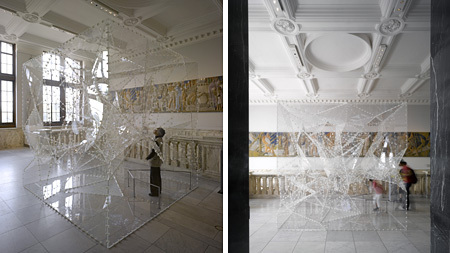 The dualities continue in the construction of its precise laser-cut plexiglas and raw hand-assembled cable-ties at its seams - as soon as the cable-ties are cut, the 'tree' would fall down flat, leaving only triangular pieces of plexiglas on the landing. Fujimoto yearns to show the transience and fragility of nature that surrounds us through the temporal qualities of this small architectural 'tree'. And as the structure basks in the afternoon sunlight that floods into the landing of the Architecture Gallery, the 'tree' becomes alive with the reflections of the large trees outside the windows, moving to the rhythm of the wind. 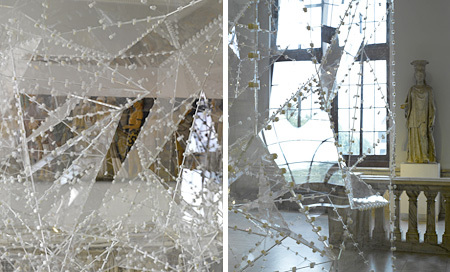 Of the seven small structures in the delightful exhibition, almost all were absolute and literal in their spatial narrative of the retreat; Fujimoto's was the exception. His transparent abstracted 'tree' structure performs as a blank canvas to receive the viewers' individual imagination of nature - I imagined sitting within a maple tree, the autumnal appearance adding a majestic glow of crimson colour and magic to the surrounding space. This sophisticated and beautiful structure is just a glimpse into Fujimoto's ingenious architectural repertoire.